The Case 570T backhoe loader. Case Construction Equipment will showcase its full line of equipment and complete solutions for construction businesses at the second edition of the Bauma Conexpo Africa exhibition, which will be held in Johannesburg, South Africa, this month (September 15 to 18). More than 20,000 visitors are expected to attend the event, where Case will line up its solutions backed by retail financing, expert service support and strong parts back-up, in collaboration with its distributor CSE. Case, which operates under the umbrella of CNH Industrial, said it aims to raise its profile at the event in addition to creating awareness of the comprehensive support it is able to provide customers. On show will be the Case skid-steer loaders and backhoe loaders – both trademark products of the brand’s offering in African and Middle East markets. 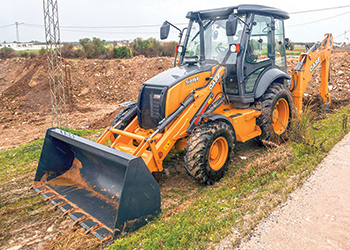 Among them will be the new 570T backhoe loader, said Case, which has been specifically designed and engineered to match the requirements of customers in the region who look for a reliable and performing machine, and a fast return on their investment. Also on display will be the 821F wheel loader, which is particularly appreciated in the mining and quarrying industries. The F Series wheel loader delivers fast acceleration, fast cycle times, high travel speeds and productivity, together with reduced fuel consumption. The benefits that the F Series brings to construction businesses have led to these machines’ steadily growing success in the region, said Case. Case B Series crawler excavators and graders have also been meeting with increasing success. The Case stand will display CX210B and CX290B crawler excavators on steel tracks. These strong, rugged machines are built for durability and performance, while the exceptional fuel efficiency and long service intervals result in low operating costs. Also at the stand will be an 885B grader, featuring a powerful engine, rugged A-frame and moldboard design, best-in-class serviceability and excellent visibility to deliver outstanding productivity on the hardest jobs. Case’s wide offering for road building operations also includes the Case 1107 DX vibratory soil compactor, which features a powerful four-cylinder water cooled turbocharged 105 hp engine that delivers excellent fuel efficiency and lengthens the operating life of the machine. With an operating weight between 11,300 kg and 12,300 kg, and two different vibration stages, the 1107 DX model offers high compaction performance.